Examining data from over 7,000 mother-child pairs the researchers discovered that pregnant women who were deficient in vitamin D (less than 50 nmol per litre in blood) were more likely to have children with low scores (bottom 25 percent) in pre-school development tests for gross and fine motor development at age 2½ years than children of vitamin D sufficient mothers. Tests included assessments of the children´s coordination, including kicking a ball, balancing and jumping as well as the usage of fine muscles, such as holding a pencil or building a tower with bricks. Vitamin D insufficiency in pregnancy was also found to affect a child’s social development at age 3½ years. No associations were found between maternal vitamin D status and other outcomes at older ages (such as IQ and reading ability at 7 to 9 years old). Lead researcher, Dr Andrea Darling from the University of Surrey, said: “The importance of vitamin D sufficiency should not be underestimated. It is well-known to be good for our musculoskeletal systems, but our research shows that if levels are low in expectant mothers, it can affect the development of their children in their early years of life. More information on vitamin D in our separate Blogs here. 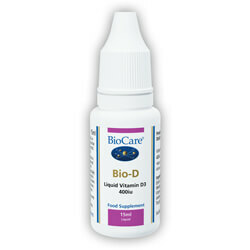 If you want to learn more about BioCare Bio-D Vitamin D3 or follow the link to our webshop.